» A little rip in the universe? A little rip in the universe? The trash and recycling trucks have come and gone, but this sad little Christmas tree was still waiting. Something must have gone wrong with the planned Christmas tree pickup of Republic Services, at least in my North Albany neighborhood. 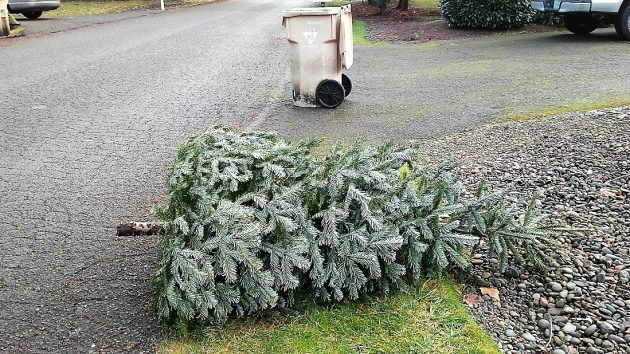 The usually super-reliable disposal service advertised on it website that it would be picking up discarded Christmas trees from Dec. 26 through Jan. 9. The usual routine is to put out the tree on the regularly scheduled pickup day during that period. It’s a convenient service, much appreciated, but this year something went awry. The tree was out there on the morning of Dec. 29, our regular trash day, and it was still there the next morning. It was out there again a week later, and it was still waiting on the verge after nighttime fell. This is a reminder of how handy it would be to have weekly yard debris pickup, even for a slight extra charge, which Republic has asked the Albany City Council to approve at least twice, in vain. Then we could chop up the tree and stuff it in the cart. As it is, the cart is full with, well, yard debris because Republic picks it up only every other week and this was not THE week. Your wish for weekly yard debris pickup (or kitchen scraps pick up, etc.) may seem like a desired convenience to some; however,. in my mind it is a revenue enhancement feature to Republic as it is mandatory for all customers, regardless of whether the service is needed or desired. In my own case, I rarely fill my lawn waste container monthly, even in the summer, having a “postage stamp” lot in a modern sub division with little lawn or shrubbery. Thankfully, our city council members have defeated this measure several times in the past. If people want this service, let them pay extra for it, but don’t make it universal and mandatory. I agree. Stay watchful, it will come up again and again. What is that? $60 for one week of convenience? No thank you. If you have storage space try a plastic reusable. Leave a little bit to be desired but it is an option. Weekly yard debris, no ! In my case with hard landscaping, I never put out yard debris even though I am paying for it. For those with large yards or during times of heavy pruning… All you need to do is call RS for an extra pick-up and pay the fee. I rarely see my neighbors yard debris bin overflowing. So why should we all pay for extra service that many don’t need ! On the tree, maybe a phone call. I agree with some of the contributors that “user pay” is the way to go. Meanwhile, what do we do with a flat-screen t.v. that has outlived its usefulness and is sitting in our garage? I’d appreciate an occasional “large item” pickup without my old bones having to drive to the dump. If people would simply stop mimicking an ancient pagan ritual (Yule Tree), this Fuax First World problem would disappear. Dream on, Hasso, Some of us are fed up with extra taxes and fees and don’t see a Christmas Tree pickup as justifying a weekly fee increase. Let (s)he who wants the extra service pay the extra fee. Well, the route supervisor was replaced a few months ago with the former customer service supervisor. The website is managed by corporate. Customer service is handled by yet another location, in AZ. It’s a wonder the service isn’t worse. I had a problem with them spilling a good portion of 2 different yard carts a couple years back. After being on hold for way too long for somebody that pays by the minute, I just took a couple pics and posted them on their Facebook page. I had an email within 5 minutes and the truck was back about 40 minutes later to clean up the mess. I am in agreement with the majority here. Most of the weeks my yard debris cart is empty. Spring and Fall see more usage, but nothing that can’t be saved up and sent out with the next pickup. I don’t want to pay more for weekly pickup service that would not be used. I see a tree tossed beside the side of the road on NW Thornton Lake Drive and corner of Thornton Lake Place. I don’t think Republic or anyone else will pick it up. I guess it will just stay there forever??? Ms Richner, if you can transport that TV you can take it to the RS yard on 12th just west of Jackson St.. That’s a drop off point for old TV’s & electronic gear. As for CHRISTmas trees. Went to artificial years ago. Open, unfold, set up & reverse after the 1st of the year. Hang a scent stick each year & like natural. Regarding weekly yard pick up…NO. We’ve got a fairly large yard in central Albany along with 5 garden beds. We just work around the every other week pick up. Quit yer complaining. Just look at the mess in 3rd world countries regarding garbage. Thank you R.S. every Tues! Thank you, Mr. Engel. I’ll do that. If you drag your Christmas tree behind your bike over to my house we will chop it up with our new chipper.. – – I think you know where I live on Springhill Drive. In our neighborhood we share our yard dumpsters. If someone has extra room they let others use that space for pickup. Some people I have seen have more than one. We also share room in our other dumpsters on garbage days. One never knows when they need a little extra room once in awhile. We have great neighbors to share many things. Ours went in the yard debris can the day after Christmas (small enough to fit with no pruning) and was picked up right away!